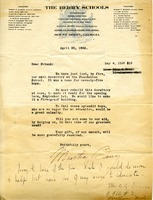 J. R. Gibson writes to Martha with a donation to help with rebuilding the lost dorm due to fire. 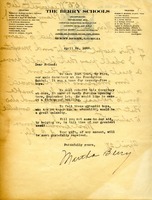 Donation to the Berry Schools from Mrs. George A. Lyon Jr. 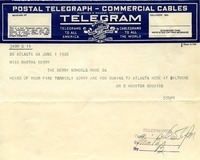 Solicitation card with check from Mrs. Geo. A. Lyon for $100.00 to help with rebuilding for 75 Boys to stay at Berry. 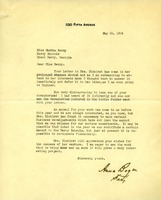 Martha writes to Mr. McKee that in fact that do need him as a Trustee and can add him to the list. She also mentions the children doing the best they can to give towards a new building to replace the one at the Foundation School. 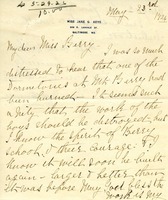 Former student, Linton Deck, sends his regrets to Martha Berry for the loss of the new dormitory by fire. 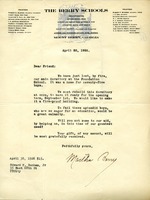 This letter was sent after a fire destroyed the dormitory for boys at the Foundation School. Ms. Berry is asking for support to rebuild the dormitory. 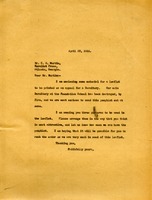 A telegram sent to Martha Berry, where C. Houston Goudiss shows concern for the fire of the almost-complete Friendship dormitory that put the school behind sixty-five thousand dollars. 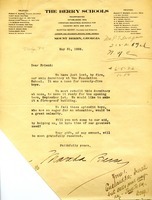 A copy of the letter that Martha sent out en-masse, this one returning from Edward Dunham with a donation of 15 dollars. 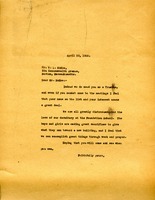 This is a letter to Mr. Martin describing what to do with the material enclosed for a leaflet written as an appeal for dormitory funding following the fire which destroyed the Foundation School. 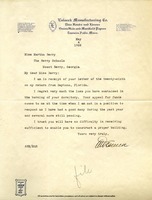 Letter refusing solicitation after dormitory fire. 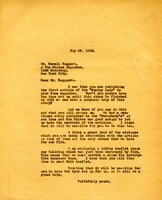 Martha writes to Mr. Haggard asking him if he would keep the type set until the Sunday Lady is complete. As well as enlosing a leaflet about the dorm fire. Mrs. Eaton sends a $36.00 donation to help towards the rebuilding of the dormitory lost by fire.